The Bureau of Labor statistics (BLS) produces annual data for over 800 occupations as part of its Occupational Employment Statistics program. The Bureau of Labor Statistics tracks the health of the U.S. economy. Along with its national-level statistics on overall unemployment, the agency also produces annual wage and employment estimates for over 800 occupations as part of its Occupational Employment Statistics (OES) program. The OES is one of several BLS datasets available in the LiveStories data library, with data available for each of the 800+ occupation categories, which are aggregated into 22 major occupation categories. Users can select one of these top-level categories or drill down into the hundreds of more specific occupations. OES includes statistics on more than 800 occupations in every state. Topics include annual estimates on total employment, mean and median wage, and associated percentile statistics. OES data available by state; additional BLS data available at the national level. Healthcare practitioners and technical occupations is one of 22 broad occupation categories in the OES dataset. 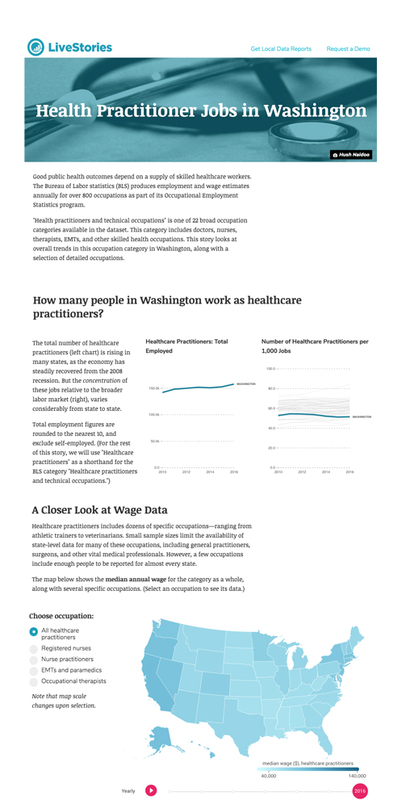 Explore some of the available data about healthcare occupations. Get the free BLS report for your state. Based on data from the BLS's Occupational Employment Statistics program, this free report explores the employment and median earning data for health practitioners.